Welcome to the Kicheva lab! 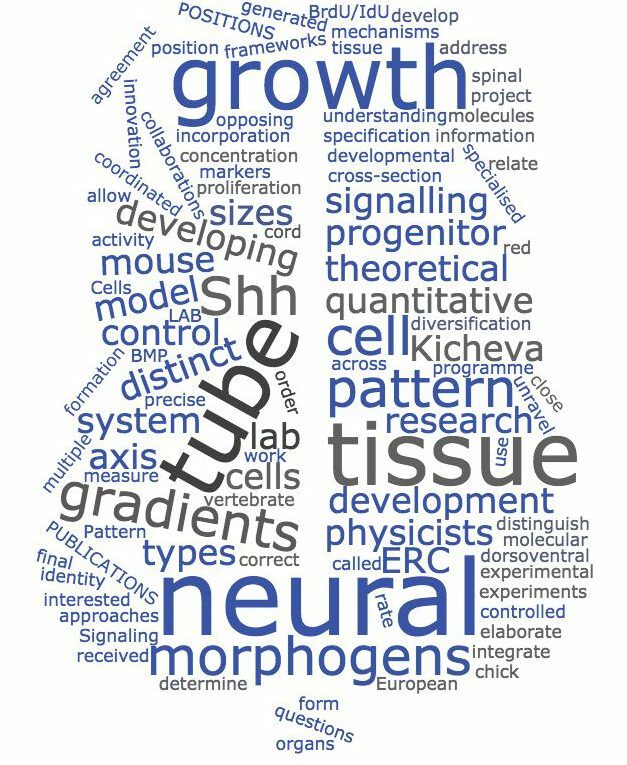 Our lab is interested in understanding how cell diversification and tissue growth are controlled during development to produce organs with correct final sizes and pattern. To address these questions, we develop and use quantitative experimental approaches that help us relate experiments to theoretical frameworks. We work in close collaborations with physicists. a) Cross-section through the developing spinal cord. b) Signaling activity gradients of BMP (red) and Shh (green). c) BrdU/IdU incorporation in the chick neural tube used to measure the rate of proliferation. d) Pattern of the mouse neural tube: these molecular markers allow us to distinguish 5 distinct progenitor domains along the DV axis. This project has received funding from the European Research Council (ERC) under the European Union’s Horizon 202 research and innovation programme (grant agreement #680037). For more information, click here.